Please see updated Right to Remain Toolkit section on submitting a fresh claim here. Please also see our Legal Updates post about problems in getting through to the Further Submissions Unit here. This is the third and final post in our series on asylum and human rights fresh claims. The first post in the series looked at what a fresh claim is and on what basis one might be made. The second post gave guidance on preparing your own fresh claim. This final post will look at the process for submitting further submissions to be considered as a fresh claim. You might submit evidence to be considered as a fresh claim after you are “appeal rights exhausted”. Further submissions/evidence can be given to the Home Office at any point after an asylum claim or human rights application is refused, but a fresh claim can only be made when appeal rights are exhausted. You or your lawyer give the Home Office the further submissions (new evidence/documentation) and the Home Office decides if it’s a fresh claim, using the legal test explained in the first post in this series. In January 2015, the Home Office announced that anyone wishing to submit further submissions will be required to make an appointment to do so, in person, at the Further Submissions Unit (FSU) in Liverpool. To make an appointment, you need to telephone the Further Submissions Unit on 0151 213 2411. The Home Office states that it will aim to make appointments within 10 working days of the initial telephone contact. 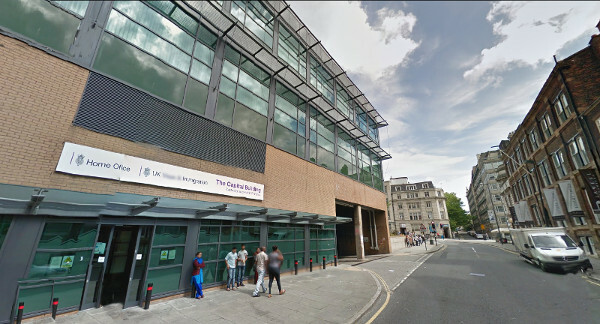 Your further submissions/fresh claim appointment will be held at the Further Submissions Unit, The Capital Building, 6 Union Street, Liverpool L3 9AF. Do not turn up without making an appointment by telephone first. There have been incidents of people being detained when they go to submit their further submissions. It is not yet known how common this is, or if this is part of a deliberate Home Office strategy. In some of these cases, the person has been held at the Further Submissions Unit while their further submissions were looked at and rejected, and then they have been taken to a detention centre. inability to travel. If you have a “disability or severe illness and are physically unable to travel” you need to contact the Further Submission Unit and discuss submitting by post. You will need to provide medical evidence that “clearly indicates a disability or severe illness that results in [you] being physically unable to travel to Liverpool”. Ongoing judicial review. If you have an ongoing judicial review challenging a removal or enforcement decision, or if you have been granted permission to proceed with a judicial review, you can submit by post. If you are detained you need to ask your Home Office caseworker how you can submit further submissions (or ask your lawyer to do this for you, if you have one). If you are serving a criminal sentence in prison. In this situation, you submit further submissions by post or fax to the Criminal Casework team. If you are in the Family Returns Process you may be able to submit your submissions at your usual reporting event. You need to discuss this with your Home Office caseworker. If your submissions are based only on Article 8 family/private life (and not a protection claim), you can submit by post. See guidance notes here on how/where to apply. Read the Right to Remain Toolkit section on Article 8 for more information on these applications. Read our posts on ‘What is a fresh claim?‘, and ‘preparing your own fresh claim‘. They have received a phone call to book an appointment after doing that. I have been trying the same for 1 week, from Monday 22nd October 2018 until Friday 26th October 2018, from 9 AM to 4 PM. All it gives me engage tone. Hi, i need to know the phone number for the further submission unit/ home office Liverpool. so if yes,what time to make a call. The phone number to call is 0151 213 2411. Some people are finding it very difficult to get through on this phone line at the moment, so you should keep trying, and try different times of day (the phone line should be open 9am till 4pm, Monday to Friday). The Home Office are also now asking people to email a scan of their new evidence to an email address they provide before they confirm that the appointment is booked. The guidance notes link for submitting a fresh claim solely on article 8 by post doesn’t appear to be working. Thanks very much for pointing this out Amber – the Home Office have now changed how these applications can be submitted (online only rather than by post). We’ve edited that section to reflect this, with new information link. Hi there. Unfortunately there’s no standard time. It could be very quick, or take months/years. You have the option of contacting the Home Office through a lawyer (or MP if you don’t have a lawyer) to ask them what is happening with your further submissions, but you must be aware that that might prompt a quicker, negative decision from the Home Office so you should be fully prepared as to what to do in these circumstances. It’s still happening with the FSU and phones, I suggest everyone flood their MP with complaints about the restrictions being placed in getting an application lodged. It all seems political and statistical to me. And that’s a good idea about contacting MPs about the FSU delays! Hi there have been calling Home office numbers in liverpool since last week waking up 9am till 4pm engaging since morning by Afternoon is ringing please Guys what I my supposed to do pls let me know thanks…..
Hi there. I’m really sorry to hear you’ve been having this problem as well. As you will see, many people are having this problem. There are a few suggested actions in the blog post, and you may particularly want to think about asking your MP to try and intervene (especially if you do not have a legal representative).